With elegant illumination in the International Gothic Style (or Beautiful Style) around 1400. 342 x 227 mm. – 383 leaves. With 1 full-page miniature and 3 historiated initials with foliate and floral border decoration. – Contemporary binding. The illumination in this book was executed by two artists, presumably in Prague. The Bohemian capital was at the time of King Wenceslaus IV (1361-1419) a melting pot for artists from neighbouring countries like Silesia, Moravia, Austria or Franconia. Artists from France and Italy were equally active in this prolific region, attracted by the erudite and refined court of Wenceslaus' predecessor and father, Emperor Charles IV (1316-1378). This amalgam of painters who cooperated and influenced each other resulted in a sophisticated variant of the international gothic style: the so-called 'beautiful style' (Schöner Stil). The master who was responsible for the initials of Ad te levavi (fol. 1r) and the Puer natus est (fol. 30v) was influenced by an illuminator named after the manuscripts for the art-loving archbishop Albert of Sternberg. He is stylistically close to the illuminator of the Sadská Bible in the National Museum Library in Prague (mss. XIII.A.8, XII.A.19, XIII.A.10, late 14th century). Both initials show a somewhat naive but delicate style with beautiful decorated, multi-coloured foliate borders and well-preserved gold sprays. 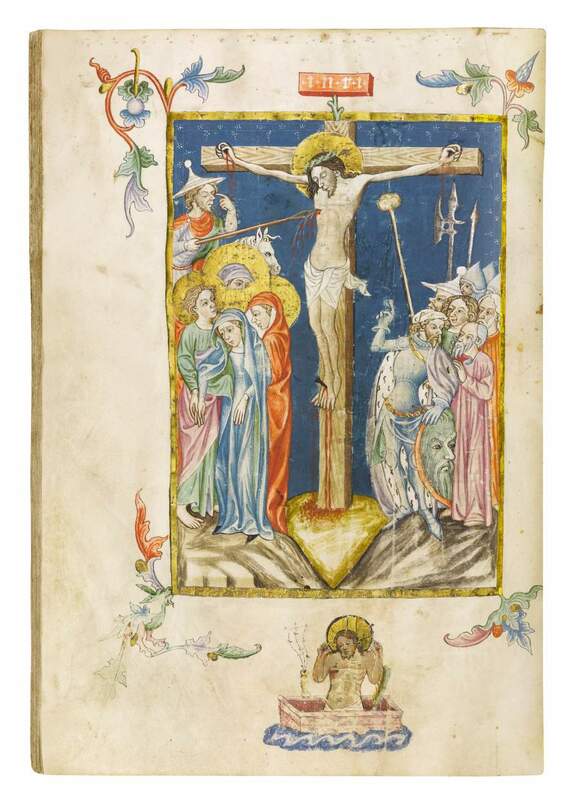 The second and best painter executed the full-page miniature with the graceful and delicately composed Crucifixion (fol. 259v) as well as the Te Igitur initial (fol. 260r. His style is characterised by outlined faces with a dash of blush, large noses, small lips with a dot of red and curly lines of hair. The Virgin's posture as well as her facial expression speaks of feebleness and resignation. The soldier Longinus points at his eyes indicating that he is cured from blindness by the blood from Christ's lateral wound. This skilful artist is identified as the Master of the Pauline Epistles (named after Cod. 2789, Vienna, ÖNB) to whom we can ascribe more than twenty manuscripts. His activity in Prague can be verified between c. 1380-1420. This stunning book is bound in a beautiful contemporary blind-stamped pigskin binding over wooden boards.